The absolute HIGHLIGHT of the entire week was the drawing of the winning ticket for the donation heifer so generously donated by 9 Mile Ranch! Congratulations to Paisley Reynolds. It’s extra exciting to see this caliber of a calf go to a junior exhibitor. I have no doubt that her grandparents, Mike and Lisa Owings of Powell Butte, Oregon, will be instrumental in making her a contender for the Red Western Classic next year!! Congratulations to our lucky winner, and a generous thank you to 9-Mile Ranch for helping the Association raise over $18,000! We changed our name to the Western States Red Angus Association! We are proud to be welcoming Nevada and California into our association! Read the May 2018 Newsletter. The Western States Red Angus Association serves California, Nevada, Oregon, Washington and Idaho. Our members are enthusiasts, seedstock producers, feedlot operators, commercial ranchers and show cattle producers. Whether they have large herds, or small herds, all of our members share a common interest in the promotion of the Red Angus breed. Membership is open to anyone interested in breeding, raising or promoting the Red Angus breed. The Western States Red Angus Association features two major annual events. 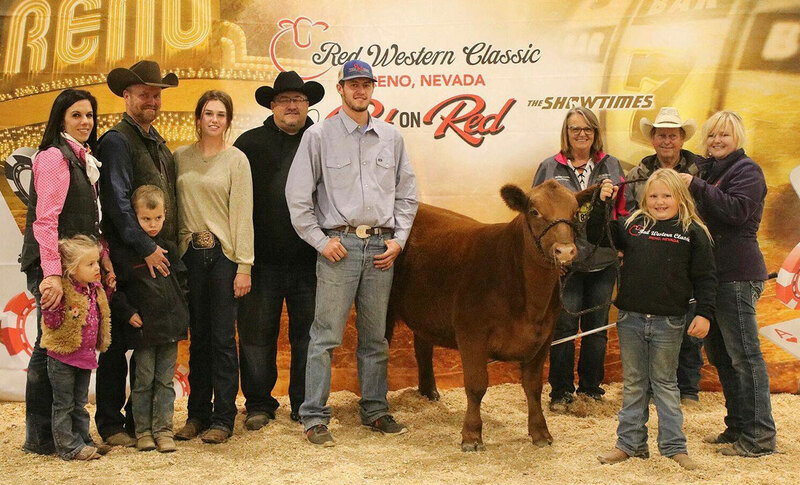 Each November, in Reno, Nevada, association members gather for the Bet on Red Sale (View 2017 Sale Catalog), and the Red Western Classic – a regional Red Angus show sponsored in part by the Red Angus Association of America. in 2007, Bet On Red Consignors decided to donate $25 per head sold in the sale to fund a futurity for juniors purchasing heifers and planning on returning with them to the Red Western Classic show the following year. It was decided to name it for Roy McPhee, a Bet On Red founder, long time Red Angus breeder, and a huge supporter of juniors who had recently passed in March of 2007. In the past 6 years, 55 head of females have been sold to juniors with over $17,000 in payouts. Visit our events page for more information or contact any of our board members or officers for more information regarding our sale, show or membership. download the 2019 membership form now. The return deadline before late fees are added is March 31st.